If you are a golfer dad and you realize that your son or daughter is showing an interest in the sport, it can be one of the happiest days of your life. It is also the day where you embark on an endless journey of finding the best gear and equipment for your son or daughter. In this, we want to elevate the process by helping you discover and find the best golf shoes for kids. Quality designed kids shoes for golf. Rubber sole material is very durable. Made for the course with EVA quality construction. Specially designed spikes for traction. Puma Golf Grip Sport JR.
Parents have mentioned that the shipping is rather slow from this brand. As far as the best golf shoes in the industry, there is a large selection. However, as far as kids golf shoes are concerned, we were pleasantly surprised by the selection kids to have as well. 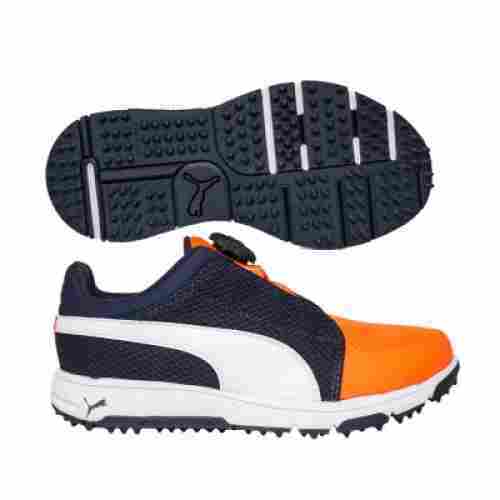 With that said, we are eager to share the DAWGS Boys Spirit Lightweight Golf Shoes and what parents can expect from these quality shoes if they are looking to give it to their child. These golf shoes for kids are specially designed for the golf course. If you want your kid to play a round of golf with you but you are unsure of what shoes to give him, these are. They are designed with a lightweight and breathable rubber material that has molded rubber spikes to ensure the best traction. Other than that, it comes with specialized holes to prevent sweating and enhance the overall breathability of the shoe. We know that when it comes to golf, having the proper footwear is crucial for the sport. With that said, the same is true when it comes to children. The reason being is that as kids feet tend to mold and adjust while growing, they need the proper foot material to ensure maximum comfort. With that said, we can say that the design of these shoes is to accommodate the foot's width and allows for arch support and massaging footbed that ensures all-day comfort. As far as cost and value, we can say that this happens to be iconic in the industry for kids. Not only are they comfortable but they provide arch and heel support and the brand has designed them with multiple colors and sizes available. If you want to ensure your child is comfortable all day, we highly recommend this set. Quality designed shoes for comfort and appearance. Traction bottom for no slip. Comfortable for kids to wear. Unisex so fits boys and girls. One of the best priced shoes. There is a wide selection of golf shoes in the industry, but nothing as good as this. This next golf shoe happens to be masterfully designed by a notable brand in the industry. Not only is PUMA is known around the world, they have excelled with their products and are always reinventing the wheel. This particular shoe is known as the Golf Unisex TitanTour Jr. shoe, for kids that want to be on the course. Here are two features parents should expect. The design of this item is strategically done for comfort and quality. Not only that, but this happens to be one of the most stylish kids shoes in the industry. Not only are they designed for comfort and quality, but they are very cool looking, which in kid world, is one of the most important factors. With that said, parents will appreciate the quality measures the brand has taken to ensure that they can withstand the test of time. These particular shoes are made from full grain leather, so they are known as high-quality shoes that are also easy to clean. Other than that, the bottom of the shoe has specialized spikes to ensure better traction on the course. With these shoes, your child will have a quality footing when golfing all day long, which not only ensures safety but comfort. As we discuss the relationship between cost and value, we can say that this happens to be one of the best kids shoes in the industry when it comes to quality and style. However, they are specially designed for gold so kids and parents should expect a quality and comfortable all day shoe. For the style and quality, we highly recommend them. But, the price is what is most shocking. This happens to be one of the most reasonably priced shoes to get on this list. Quality design sports shoe for kids. Synthetic material that is highly durable. Classic adidas inspired logo design with the three side stripes. Two color choices and multiple sizes to choose from. One of the most costly kids shoe on this list. As the next golf shoe on this list for kids, this brand is known as an excellent brand with plenty of quality features that have made them known in the sportswear industry. Let’s talk about the Adidas JR 360 Traxion Golf Cleated shoe and what individuals can expect from this quality item. Here are two important points to take into consideration this item. This brand is known for their excellent craftsmanship and customer care and quality. Not only that but they are known for their quality everyday wear which is known to be highly durable. These particular golf shoes are no different, they are known to be durable and perfect for little kids. When it comes to a brand that excels in design quality and craftsmanship, Adidas is the brand to trust. Not only that but these shoes offer one of the best designs for kids. First, the shoes are specifically formulated for a child’s foot and they have the sole and durability that a child’s foot needs for the kid to be comfortable. With that said, the bottom also has a cleated design that ensures traction when on the golf course. Let's take a minute and talk about cost and value. We can say that this is one of the most notable brands in the industry for the design and the quality. Not only that, but they are known for excellent customer satisfaction. In fact, these shoes have five-star ratings and customers are very happy. Many customers tout that their child loves wearing and shoe and feels comfortable all day long. 4. Puma Golf Grip Sport JR.
Quality shoe from a quality brand. Rubber sole material is highly durable. Disc technology for all day comfort. FushionFoam material for more comfort and cushioning. Performance mesh is high quality. Individuals have mentioned that the Puma emblem has fallen of after wear and tare. May be quiet costly depending on the size and color. It is rare that we share more than one brand on a top ten list because it is our goal to supply variety. However, when it comes to this particular brand, individuals can expect this and another shoe on this list. With that said, let’s talk about the Puma Golf Grip Sport Jr. and the many benefits of this particular shoe. When it comes to this brand, individuals can expect comfort alongside durability. With that said, they are known for their quality materials and expert craftsmanship, which ensures an all day durable design. Now, part of the comfort of this shoe is the FusionFoam technology which enhances the cushioning of the shoe so kids can wear it all day long on and off the course. With that said, the outsole is durable for all day wear and tear. Part of the quality of this particular shoe is the performance mesh technology. The mesh material of this shoe makes it a top contender for the throne, ensuring more breathability and comfort for the child wearing it. Since the mesh is such a breathable material, this shoe is perfect for all-day wear and tear on hot weather. So, parents, give your child the gift of comfort with these particular shoes and enjoy an all-day experience on the course. When looking at cost and value, we can say that this happens to be one of the greatest products in the industry when it comes to child comfort and quality. Alongside this, the brand is highly touted and, although the shoe can be quiet expensive, parents will appreciate the long lasting durability and kids will appreciate the all-day comfort and quality. Highly flexible spike less design made with pure motion features. Lightweight technology and quality sock liner. Abrasion resistant for all day wear and tear. Can take a while to break into. 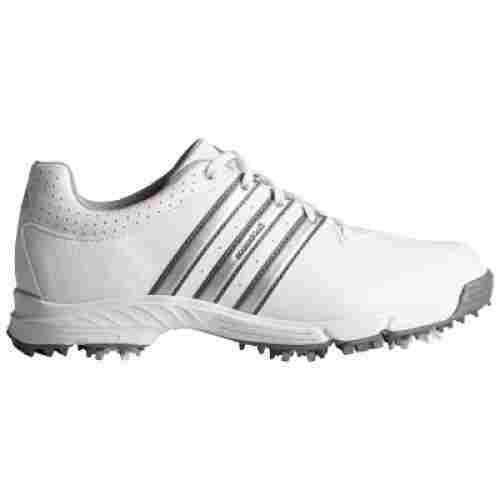 These next golf shoes on this list come from the Adidas brand and are known for excellence and durability. Let’s talk about the Adidas Golf 2017 Kids Jr. Adicross V Golf Shoes and what individuals can expect from these quality golf shoes today. Other than being stylish, there are many different cool features and quality elements that make these golf shoes perfect for the course. Here are two! The outsole of these particular shoes tend to be different than most. Yes, they are designed for traction but unlike cleat shoes that use spikes, this brand has designed the shoe with strategically-placed lugs that have a quality grip and of course, versatility. Essentially, a child can wear these quality shoes on and off the golf course. When it comes to comfort, premium brands know what it takes to be the best. With that said, the design of these particular shoes ensures all-day comfort. In fact, individuals can wear these shoes all day long and feel on a cloud, literally. The Cloud Foam technology ensures a better quality cushioning design. It is important to say that this happens to be one of the best shoes on the list. Not only is the brand masterful in their quality, but the shoe integrates a seamless quality design alongside a fun cool look that kids will love and appreciate. If you want your best pal, your son or daughter on the course with you, we recommend these quality shoes. Quality leather shoes made for comfort and durability. Shaft is a Hi-Top material. GripZone Traction is well designed. Can be hard to break into. Now, we have talked about this brand twice already. However, when it comes to the design and aesthetics, this shoe happens to be one of the coolest and most stylish on the list. These shoes are perfect for the child that not only wants to golf but golf with style. Let’s talk about the Puma Golf Kid’s Titantour Hi-Top SE JR. and what kids can expect from this quality shoe today. It goes without saying that golf shoes, much like soccer shoes, need quality traction. With that in mind, we can say that these shoes offer masterful traction quality for the design and price. In fact, the traction is due to a GripZone Traction technology and design that the brand has implemented in their shoes. With that in mind, we can say that the GripZone is designed for comfort but also to be worn off the green. These two words say it all, these shoes happen to be one of the coolest and most comfortable shoes. The Hi-Top design ensures more safety and comfort in the ankle region while golfing, while the interior Fusion Foam technology is so the child feels an added layer of comfort and security with the shoe. With that said, we can say that the design is a fan favorite among kids. What can one expect from this brand when it comes to price? Well, as far as the quality and design of these shoes, we can say that they are great for kids. Now, what is most surprising is that the cost is actually quite affordable, much less than the last shoes on the list. With that said, there is a wide variety of different sizes to choose from. If your child loves golf and Hi-Tops, we recommend these shoes. Quality shoe designed for everyday comfort. Two different color tones to choose from. The outsole proves to have a lot of traction. As the next quality golf shoe on this list, we want to share the Nike Control Junior Golf Shoes, which are designed for quality and comfort. These shoes are known as one of the best for kids and the brand is known as one of the best in the industry when it comes to sportswear. Not only that, but this brand is highly trusted. Here are two features and points to consider about this shoe. Nike is known as the ‘runner’s brand’. With that said, these particular shoes offer the same endurance that one would expect from quality running shoes but for golf shoes. With that in mind, we can say that the overall quality of these shoes ensure that a child will be able to wear the shoe all day long and be highly comfortable. With that in mind, we highly believe these shoes are perfect for kids that love to golf. One aspect that makes Nike a masterful brand to consider is the detail of their shoes. These particular shoes have a quality outsole material that ensures more durability and comfort. However, they are specially formulated with traction so kids can be comfortable and safe on and off the track. Now, part of their detail quality is the way the traction bottom of the outsole connects with the upper of the shoe to ensure quality durability. Cost and value for this particular shoe go unprecedented. When it comes to value, kids will appreciate the overall quality of the shoe alongside the comfort. As an added bonus, these shoes are highly stylish. However, the cost can be difficult to determine because the shoe price can range drastically depending on the size chosen. Quality designed shoe for kids. Full-length phylon interior midsole designed for comfort. Rubber outsole material is durable. Integrated spike design is great for traction. Are you shocked to see another shoe from this brand? 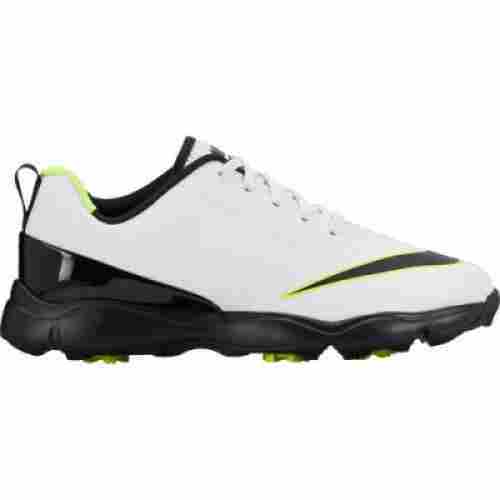 On our end, we are eager to share the Nike Golf Range Boy’s Golf Shoe. This shoe is comfortable, has a really cool design, and is comfortable to wear. With that said, we want to share two specific reasons why this shoe is perfect for the kid golfer. Here are two features to consider of this quality shoe. Part of the material quality of this shoe is the mesh exterior. Not only that, but the mesh exterior ensures everyday wear and tear and breathability. Meaning, if a child is on the course all day long, to avoid sweaty feet and bad foot odor, we highly recommend these golf shoes. With that said, the exterior is also made of Polyurethane that is Thermoplastic to ensure better temperature balance. Part of what makes this shoe a perfect golf shoe for kids is the integrated spike design on the bottom of the shoe. In fact, the spike design allows for a kid to wear the shoe on and off the course. However, the bottom traction ensures that the child will get a good footing in when golfing. Now it is time to talk about cost and value for this item and we can say that compared to the last item on the list, this one is perfectly priced for the quality. In fact, the price makes it compete with many other quality shoes on this list. With that said, we highly recommend these for the style, the design, and the price overall. Quality and comfortable shoe material and design. Durable and equipped with rubber traction bottom. The upper is made of SoftLite and it is very lightweight. Easy care and daily comfort. Only one color choice to choose from. Coming close to the end of this list and we are ready to share another shoe that is designed for durability and simplicity. This item happens to be a leader in the industry for the price and the design and with that, we are excited to share it with you. This is what parents and kids can expect from the FootJoy Kid’s Empower Golf Shoes. Here are two features to consider. This shoe boasts a great traction design that many different brands boast. When it comes to the traction bottom brands either go with spiked bottom or spikeless. 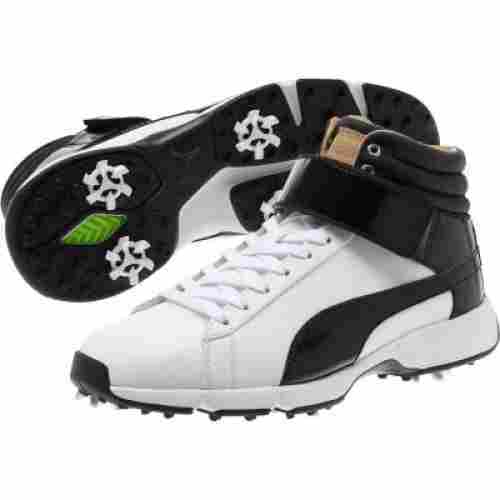 This particular golf shoe has spikeless but rubber bottoms to ensure traction on the green without the heavy traction weight that spikes cause. With that said, kids will still be able to enjoy being on the course all day. This particular shoe has a notable upper design that is not found elsewhere in the industry. The upper is made from a SoftLite material engineered mesh to ensure better all-day breathability. Alongside this, the mesh allows for the shoe to be more lightweight and comfortable. What we can say is we highly recommend it for the comfort and the air-breathability qualities of the shoe, so the kids are comfortable all day. We can say that this happens to be a notable product in the industry for the simple design. Other than that, this brand is trusted and known to offer excellent quality. However, as an added bonus, the shoe is one of the most affordable. So if your child is not a frequent golfer, but wants to accompany you on day trips, we highly recommend this shoe. Quality and comfortable all-day shoes. Integrated lacing system for a locked in fit. TPU outsole is comfortable and lightweight. UV Rotational Resistant for better traction on the course. Now that we have come to the end of this list, we want to share a quality brand that although the item is lacking reviews online, this brand is known for excellent quality. Alongside this, these shoes must be one of the most comfortable to wear all day long. This is the Under Armour Jordan Spieth One Junior Golf Shoes. Here are two features of this quality golf shoe. Part of the overall quality of this item is the material design. The material design of this shoe is known as a TPU outsole material that is lightweight and constructed from an EVA midsole that is also responsive to the way a child’s foot is. With that in mind, the cushioning of the shoe is excellent and offers all-day comfort and balance. Part of the overall quality of these shoes is the Clarino Microfiber Leather. This leather material is highly durable and well designed for all-day wear and tear. Alongside this, we recommend it because of the quality and aesthetics of the shoe. The white design with the black and red accents make it highly appealing. Although these shoes have no reviews online, they are known as one of the most durable. With that said, we can guarantee that individuals will be fans of this particular shoe. They are comfortable, design for quality and kids will like the cool quality. On top of this, the most important part which is the bottom of the shoe offers excellent traction. The price may vary, but not by much! When we first started this buying guide, we discovered that the quality of a shoe is primarily determined by the overall construction quality of the shoe. Therefore, we went with brands that we knew would expertly design their items with durability at the forefront of the construction of the shoe. Alongside this, one important aspect when selecting the best shoe was reading the top reviews to ensure that customers were satisfied. In this process, we discovered that all of the products we shared are above four stars and guaranteed for customer satisfaction, child comfort, and maximum durability. When it comes to picking the top ten best products, we can say that comfort happens to be one of the most important aspects. I mean, would you want your children wearing golf shoes that were uncomfortable for all 9 or 18 holes? Not only did we focus on comfort because, well, it is the game of golf, but because the product is for kids. Therefore, we wanted to guarantee maximum comfort for the child. Now, as far as comfort we noticed that one of the most important factors is the insole cushioning. After further research, we learned that most insole cushions are designed with some kind of shock-absorbent technology that ensures a child can wear them all day. Alongside this, other comfort features include breathable designs from brands such as Nike and Puma. Breathable designs ensure that a child can wear the item all day without the foot getting uncomfortable. This next important criterion is part of what kid’s find to be the most important. When it comes to parents, they care about durability, comfort, and the cost. Kids care about style! Therefore, we wanted to speak the language of children by sharing the top ten best looking golf shoes as well. Whether your child loves a stealthy and unique look or a fun and simple design with a mesh top, we can say that these shoes are all very stylish and kids will be happy. Other than that, we wanted to share shoes from top brands that know a few important tricks of the trade when it comes to design. For example, Adidas is known for their signature stripes while PUMA is known for their stealthy and modern looking shoes. It is important to say that the cost is one of the determining factors of whether an individual will buy a product. With that said, we wanted to share a wide variety of different prices, so parents had the option to choose. It is important to say, however, that the price will vary distinctively depending on the size and the color of the item, which can lead to more costly results. In any case, one aspect of our guidelines was to ensure the best value for the cost. You should always double check with the golf course management if they allow shoes with spikes before wearing them to the golf course. Some people think you can just wear your soccer shoes or baseball shoes to play golf but you shouldn't. Golf shoe spikes are a lot shorter than most other sport's shoes and if they're too long they could end up ruining the golf course. q: Are the shoes breathable? The answer to this question is that it depends on the shoe. However, most brands on this list to offer the shoes to be breathable and are excellent quality. For instance, the shoes that are breathable boast a mesh top design to ensure that the child is comfortable. q: Can the shoes be worn on and off the course? The answer to this question depends all on the bottom traction of the shoe. For instance, most cleat bottoms are not intended to be worn out of the course, green, or grass. However, some shoes we have shared are designed with traction bottoms but can be worn on different surfaces other than grass because it is not a pointed bottom. q: Is the shoe machine washable? When it comes to machine washable shoes, this is actually a question that is primarily dependent on the manufacturer. Since most shoes have some kind of glue holding it together, machine washing it on hot or warm would be a bad idea. q: What is the insole? The insole of a shoe depends on the manufacturer. However, we can say that most insole designs are intended to be shock absorbent or offer some kind of quality cushioning for the individual wearing the item.